***** Pantomime season continues with a pantomime whose story I have heard of but do not know performed by a company I have heard of but before now have not seen performed in the form of Robinson Crusoe and The Pirates performed by Handsworth and Hallam Theatre Company (HHTC) at the Montgomery Theatre, Sheffield. The pantomime on the high seas, which promised to be packed with songs, dances and lots of silliness, tells the story of Young Robinson Crusoe, who has always had an appetite for adventure and has no desire to take over the family fish and chip shop, his family and the evil Captain Blacktashe and the lost temple of treasure on Skull Island. With the audience clapping along from the moment the orchestra began playing a melody of sea shanties, the Mergirls (Ria Westhead, Amy McGregor and Bev Walker) combined the look of camp disco divas with fabulous soul voices, including one channeling her inner Sue Pollard, provided a spectacular start to a great show. “Hello” introduced the audience to both the characters and the beautiful crisp voices and choreography (thanks to Hayley Wilbourne and Beth Cooke) of them and all of the ensemble, with its lyrics promising “this show will change your life”, which as it made the audience happier is true; before “I Think We Got Love” showcased Amy Roe-Parkin (as Polly Perkin’s) pure pop princess voice. The show’s use of “Ghostbusters” confirmed that my favourite take on the classic panto singing bench scene involves a classic 80s movie theme-tune and no need for a bench, unless it’s under a truth tree, whilst the encore number “I’m Still Standing” provided an opportunity for not only another great costume change (thanks to all of the costume and wardrobe team) but for the cast to show off their jive steps and for my favourite dame costume of the night. In terms of dance numbers, “Swashbuckle” gave the ensemble the chance to show off their tap dancing skills and showed how the older ensemble members look after the youngest; whilst the calypso ballet style routine of “Hawaiian Rollercoaster” provided the sweetest moment of the show as the children in the ensemble getting their moment in the spotlight; before “Welcome to the Jungle” provided the opportunity for the young adults in the company to show off their ballet and contemporary dance skills. The three kids from the audience brought on to the stage for the “Music Man” number proved that when a dame asks you who your favourite character is, the correct answer is always “you”, before the dame sitting on the side of the stage with the youngest of the three telling the story of the magic panto balloon became a beautiful moment and left me hoping the little girl finds £20 under her pillow. My favourite scene of the show took place in the “Salty Towers” (remind anyone of a certain sitcom) fish and chip shop, which brilliantly combined tongue twisters, egg-cellent physical comedy, water pistols (the front few rows of the stalls are warned), plates of raw batter being used as custard pies on random audience heads and the Benny Hill music to keep the audience in stitches. Whilst, the dame’s desert island discs comedy routine not only included at least one album from my own vinyl collection but provided the most entertainment you can have with vinyl without a record player. My stand out performance, and officially my new favourite dame, came from Matthew Walker, who I have praised for previous roles in musicals and who also directed this production as his directing debut, continuing to prove he is wonderful at whatever he turns his hands to in the theatre world, offering audience patronisation, great stage presence and comic timing and guaranteeing to leave “I say fish, you say fingers” stuck in audience heads for a long time to come and being grateful the dame’s back was to them for the climax of the stripper routine. Andrew Stansall in the title role Robinson not only displaying a fantastic smile, charisma and stage presence but also played the role as the perfect Disney hero opposite Amy Roe-Parkin who perfected the innocent girl next door experiencing falling in love for the first time and who the audience couldn’t help loving too, whilst also displaying a sweet father/daughter relationship with her on stage father. Other cast members who deserve a mention include Steve Mather as Captain Blacktashe, who combined Peter Pan’s Captain Hook with a pinch of comedian Jack Dee; and Debbie Mather as Winkle who reminded me of Paul Whitehouse and whose on stage chemistry with her husband Steve shone through to produce wonderful comedy, although she would never get a job with MI5. Stuart Ogden as Polly’s father Peter Perkins not only p-p-p-p-p-p-p-perfected his stutter but proved you should never believe someone who walks with a frame can’t dance. Robert Taylor and Joseph Walker as Captain Crusoe and Sprat Crusoe provided laugh out loud father / son Chuckle Brother style humour, including prop one-liners that “Gavin and Stacey’s” Smithy would have happily stolen for his best man’s speech, though Joseph won’t get a job as a Lady Ga Ga tribute act anytime soon. Alison Stansell as Calypso not only offered wonderful rhymes but seemed to live and breathe her inner spirit of the sea whenever she appeared on stage. Keith Harriott as Pinchy Stryder (aka Crabstick) proved we all need a reggae crab in our lives to brighten up our days both under the sea and on dry land; whilst Luke Harriott as Man Friday not only pulled off a great American accent but in the show’s re-wording of a classic Barry Manilow number “On The Island” displayed a voice (though not the cannibal tendencies) that Barry himself would be impressed by. Last but not least I must mention ensemble member Ria Westhead, who had minor roles as one of the Mergirls and the Baker and for me had the stand-out singing voice of the entire ensemble as well as the biggest smile of the entire cast. Offering up one of the more unusual pantomimes in order to present something different to the norm for audiences, the show was packed with the perfect blend of child friendly comedy, adult innuendos, old and new jokes, and local and pop culture laugh out loud humour, leaving the audiences with smiles on their faces. The show is the nearest I’ve watched to the perfect pantomime and I find it impossible to fault, with the cast clearly enjoying performing in he show as much as the audience enjoyed watching it. Packed with near perfect performances, voices, choreography, casting and comedy that wouldn’t be out of place on a professional stage, via a script full of wonderful characters, stories, rhymes, humour and the need for enthusiastic overacting throughout. Formed in 2002 from the merger of Handsworth Amateur Operatic Society and Sheffield Hallam Operatic Society, HHTC aim to be the leading family amateur theatre group in Sheffield, providing good quality musical theatre by putting on two shows a year, a pantomime and a musical. For further information visit www.hhtcsheffield.co.uk. 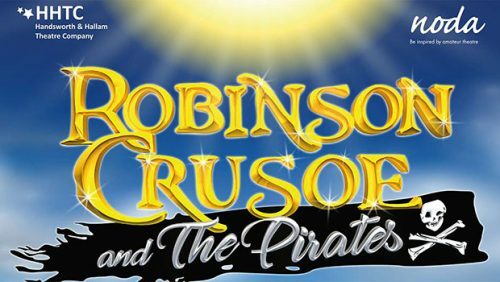 Tickets for Robinson Crusoe, which is on at the Montgomery Theatre on Saturday 27 January at 2.15pm and 7.15pm and on Sunday 28 January at 12noon and 5pm are £15 for adults and £13 for children and OAPs with a family ticket for two adults and two children priced at £52. To book telephone 07586 293546, email hhtctickets@live.co.uk or visit http://themontgomery.org.uk. P.S. I recommend picking up a copy of the programme, not only to find out more about the cast and crew, including some great photographs of them pulling faces, but for the wordsearch to keep kids of all ages entertained during the interval.